Recipe by Veronica Callaghan, WinningDishes.com. 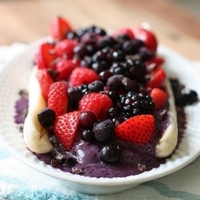 In your blender or smoothie maker, combine the 1 1/2 cup of blueberries, yogurt and green mint tea; blend until smooth. 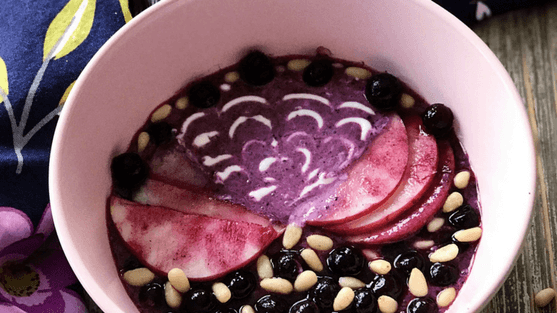 Pour the smoothie into 2 serving bowls. 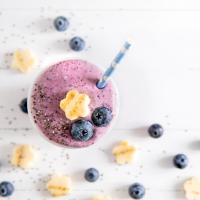 Arrange desired amount of frozen Wild Blueberries in each bowl on top of the smoothies. Rub the apple slices with a few of the frozen berries to create a tie-dyed affect then arrange a few slices on each. Scatter the pignoli (pine) nuts over the blueberries in each.